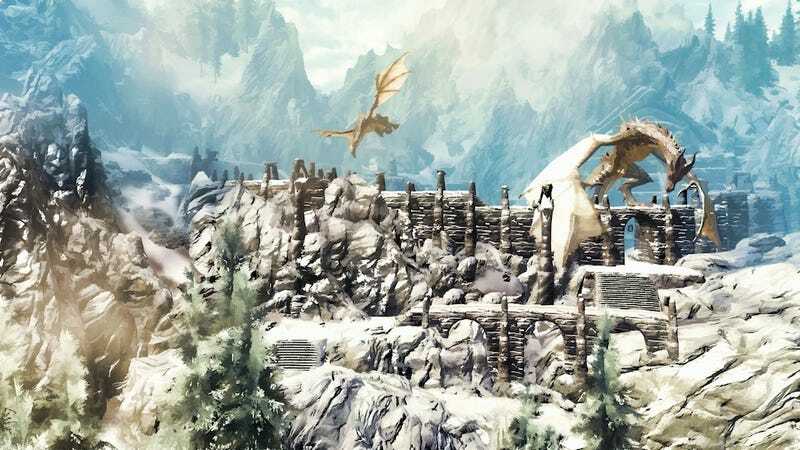 Skyrim was a ridiculously large game, and so it makes sense that a comprehensive look at how developer Bethesda built it would be equally large. And lo, it is—this massive breakdown posted by Bethesda senior designer Joel Burgess goes deeper than the deepest crypt and farther afield than the farthest… field. The article, which is based on a talk co-written with Nate Purkeypile and given at this year's Game Developers Conference, is pretty technical, but if you're even casually interested in how games get made, it's worth a read. I liked an early bit about how they approached reducing "art fatigue," their term for when players begin to notice the cookie-cutter design and reused art assets in the many repeating dungeons. We've found some ways to delay the onset of Art Fatigue. One of the big ones is simply doing away with copy and paste design as much as possible. When I first joined Bethesda, Oblivion was poised for the home stretch of its development cycle. Oblivion was of similar scope to Skyrim, yet built by a team of about half the size. One of the ways the dungeon art team coped with this disparity was to create a number of “warehouse” cells in the editor. These warehouses contained fully lit and cluttered rooms to copy, paste, and then arrange to create "new" dungeons. While efficient, this method left much to be desired, and many players rightfully called Oblivion dungeons out as being “cookie-cutter”. One thing we noticed was that players were quicker to react negatively to repeated detail elements, as opposed to broad architectural repetition. Consider the following three screenshots, each taken from a separate Oblivion Dungeon. In each, you’re more likely to pick up on repeated clutter first, then the repeated architecture. This is especially true in actual gameplay from a first-person perspective. To minimize needless repetition, we abolished the use of warehouse cells as they existed in Oblivion. Beginning with Fallout 3, we staffed up a group of level designers and got tool support to make sure we were able to build spaces more quickly, and with the most granular art available, reducing the amount of repetition as much as we possibly could. The whole thing is worth looking over; check it out here.